" Ayurveda is the knowledge that indicates the appropriate and inappropriate, happy or sorrowful conditions of living, what is auspicious or inauspicious for longevity, as well as the measure of life itself. " Ayurveda is the ancient Indian health science that goes hand in hand with yoga ... and if you really want health, vitality and abundance in your life, then you NEED to know about it too! The beauty of Ayurveda is that it does not take years of study and training to be able to benefit greatly from it. As the saying goes, "A little Ayurveda goes a long long way." ... and that's exactly what The Ayurveda Workshop is designed to do -- to give you a simple but practical introduction into this profound science that will show you just how easy a few simple ideas can translate into REAL Health Results. Did You Know the Ancient Yogis Lived For 400 Years? Some say even longer! Exactly how long though, no one can really say for sure. In any case, there are many accounts of yoga masters living lives of health and longevity that would definitely defy our modern ideas about human lifespan and health. What did they know that you don't ? * and How You Can Learn it Too! Through lifetimes of experiements, along with knowledge passed down through countless generations of gurus and disciples, the masters of ancient India made some astounding discoveries ... discoveries that uncovered the mystries of the full spectrum of human health ... the physical, mental, emotional and higher spiritual too. They not only gained a profound understanding of the nature of this human life, but also our place within this vast Universe around us, and the means by which to thrive and flourish within it. And It's Easy For You To Learn Too! I've probably studied Ayurveda a little bit more than the average person, but that's just because I'm really into things like Yoga and Ayurveda. But YOU don't have to go back to school and strain your brain for years to learn a few really useful things ... practical things that can have a real immediate effect on your health and how you feel. Help YOU To Get .. Both Yoga and Ayurveda belong to the Vedic culture of ancient India. Together they encourage a particular way of life, a way of co-operating with Nature and living in harmony with her for our maximum mutual benefit. Most of us aren't living in this harmony. In fact, most of us aren't even close! ... and as a result, life has become a constant struggle for so many good people like you and me. ... Simple Changes that can have a Major Effect on our health and our success in life! That's exactly what a little understanding of Ayurveda science can do for YOU! But it also shows us how to more clearly see our own inherent strengths and weaknesses on a psychological and emotional level too ... guiding us toward pursuits and actions that we are most likely to benefit from, while helping us to steer clear of the things that are likely to set us back ... both in health, and in wealth. ... a science that was designed quite simply to allow for the most beneficial and healthy enjoyment of our time here on earth. Do You Know The Best Thing I've Gained Through Ayurveda? ... and to understand what the real challenges are that they deal with on a daily basis (even if they, themselves don't understand what is really going on). Ayurveda has truly taken the frustration out of life for me. If you've tried dozens of diets, and been dissapointed; tried countless health and exercise systems, and never gotten anywhere ... then it's time for you to learn about Ayurveda. By learning just a few basic principles of this age-old science, even the average person can easily overcome years of struggle and frustration with their health, their diet, their job, and perhaps even more importantly, their relationships too. 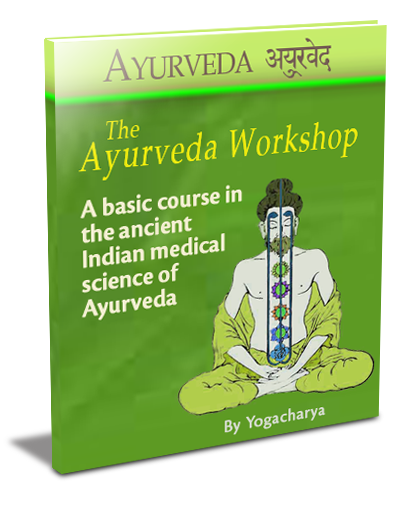 The Ayurveda Workshop is NOT a book of boring Indian medical theories and principles. It's a simple little step-by-step introduction to the practical principles and techniques of Ayurveda that will make you sit right up and take notice of exactly where you've been going so wrong with you approach to health ... and show you exactly what to do about it. ... so that you can begin to take some simple, but very effective steps toward better health and greater abundance in your life. 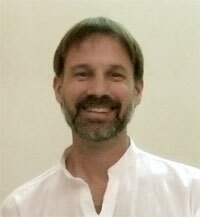 Hello, I’m Yogacharya, the Founder of International Yogalayam and author of The Ayurveda Workshop. I’ve been exceptionally fortunate in my life. I’ve had the opportunity to do what most people only dream of … like spending many years in exotic India studying the ancient traditions of Yoga and Ayurveda. With my previous experience as a health-care practitioner in Canada, it didn’t take long for me to recognized the profound wisdom within this ancient Indian medical science, and the intimate connection it had with Yoga. The more I learned about Ayurveda, the more I understood just how important it was as a practitioner and teacher of Yoga to possess this knowledge too. Ayurveda and Yoga were always considered to be two complimentary halves of the secret for achieving a balanced, healthy and happy life. I came to realize that every practitioner of yoga really needs to have at least a basic understanding of Ayurveda too, if they truly want to gain all they can out of their yoga efforts. But getting a practical introduction to Ayurveda isn’t so easy. Most books on the subject, though written by knowledgeable people, are, well to put it bluntly, pretty drab and boring. Unfortunately, they are usually written by scholarly types who might certainly know the subject, but rarely how to speak in terms that “normal people” can easily digest. Or worse ... they are written by Indian intellectuals! If you’ve ever read books written by Indian doctors or academics, you’ll know about the painfully formal language they often use. Sure, there is no disputing the wisdom of their words, but let’s face it, drab and boring would be too kind a way to describe many of these publications. I have read so many of them, and let me tell you, if you’re having trouble sleeping at night, they beat counting sheep any day! The Irony is that Ayurveda Science is NOT Drab OR Boring! … and learning about it certainly doesn’t have to remind you of those days when you struggled to just keep your eyes open at the back of your “English Lit. 101” class. I’m a writer and a communicator … and I know that this profound science of health and wellbeing CAN be presented in a much more interesting way. THAT IS WHY I created the Ayurveda Workshop! Ayurveda explained in easy to understand terms! Simple tools to help you learn what career is best suited for YOU! 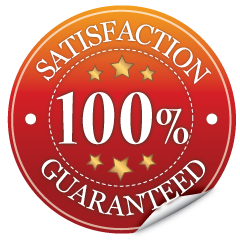 Just like all our programs, if after 60 days you are not completely satisfied for any reason at all, simply say so for a full, courteous, no questions asked refund. The Ayurveda Workshop is a downloadable eCourse. No physical products will be shipped. The e-course format is Adobe PDF, which can be viewed on Mac or PC. After you order has been processed, you will receive an email providing you INSTANT ACCESS to this training program, along with instructions on how to use it.